Property Size 1,010 sq. ft.
Coronado Place is located just east of Sabino Canyon Road off of Tanque Verde. Close to dining and shopping. Located on a bus line with easy access to Udall Park and Recreation. 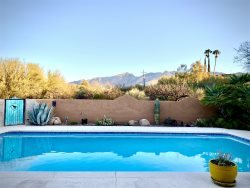 Drive to Sabino Canyon or Mt Lemmon in just minutes. Wonderfully decorated this two bedroom, two bath condo offers a master suite loft and large walk in closet. The enclosed patio has a BBQ grill and patio furniture. Plenty of room and lots of sunshine will make your stay in this condo just perfect. Close to parking and the pool.